The Courtesan is a rare species in Singapore, but makes regular appearances across the island from nature trails to urban parks and gardens. It is a species that displays sexual dimorphism - with the male appearing quite different from the female, including an obvious size difference and shape of wings. The female also exhibits Batesian mimicry in that both the two extant forms, f-isina and f-eupleoides mimic the male and female of the distasteful Danaid, the Magpie Crow. 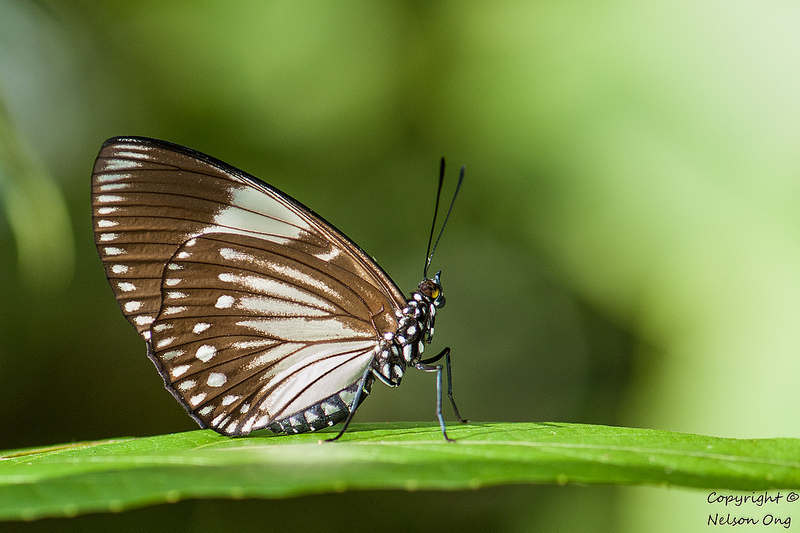 Sightings of the females of the Courtesan are even much rarer, and this photo, taken by ButterflyCircle member Nelson Ong, features the f-eupleoides which is more often seen than the other form, f-isina. The caterpillar host plant of this species is Trema tomentosa a fairly common mid-sized tree that is found all over Singapore, but is never abundant.